Here is a group of six ballet dancers during the interval, in front of the décor. Three of them are sketched in the background, but the position of those in the front of the stage clearly indicates that they are all resting and that the effort has been hard. In fact, the dancer in the foreground tying her ballet shoe is bent forward, her arms hanging, while behind her, two other dancers are sitting, one of them taking advantage to relax her feet, the other to get her breath back. Slumped in such a way, the corps de ballet no longer inspires that feeling of ephemeral escape which incites the audience to applaud. It is therefore not the grace of a movement which Forain depicts here, but the reality of the show. It is not the magic of ballet which he underlines, but the exhaustion overcoming the dancers. However, the realism is tempered by the light delicately caressing the skin and brightening up the tutus. A harmony of pink gauze invades the picture, providing a note of lightness and femininity to the whole. The artist's flighty touch, inherited from the Impressionists, brings out the diaphanous tulle as well as the flowers which adorn the dancers' hair. The nervous brushstrokes depict the struts of the wings but miss out the detail of their multi-coloured plant motifs. 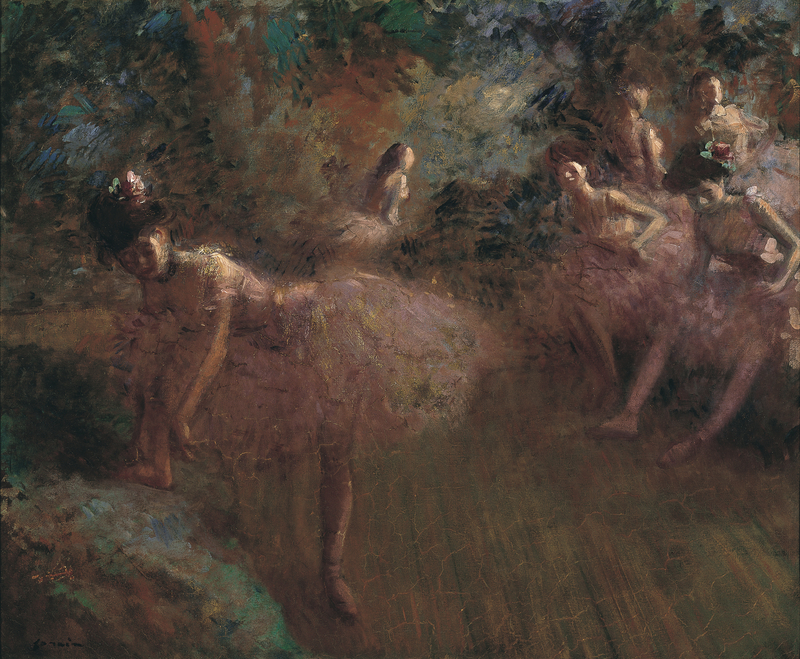 This painting from his mature years shows the artist's detailed knowledge of the world of ballet. Since the beginning of his career, he often used to go to the Opéra, not only to study bodies in movement, but also to understand the varied effects of artificial light. In this work, Forain concentrates all his attention on the rays of the spotlights coming from the right, thus becoming the follower of Gavarni, Daumier and Degas, who were also interested in stage lighting. If the opera is one of Forain's preferred subjects, a small number of his works deals with the precise moment when the curtain has just dropped, the moment when relaxation follows tension. More often than not, Forain's dancers are met backstage or in the dressing rooms by their patrons, the opera-goers who maintain them (Backstage, Paris, Musée du Petit Palais, or In Front of the Backdrop, Memphis (TN), Dixon Gallery Museum). With a moralising tone, Forain castigates those rich bourgeois in tails and top hat who take advantage of their condition to exploit the young dancers. Here the season ticket holders have not appeared yet. but it will not be long.